I really am a loser when it comes to a lot of things. One of the better examples of this is that I read soda industry news sites and message boards, to see what new products are coming out. How I am with soda is similar to how I am with cereal. I look around, see what’s out there and coming up. However, Kellogg’s new offering, which was plucked straight from Heaven and delivered to store shelves, apparently went unnoticed by me when it was being announced. In literally the first paragraph I ever wrote for this site (well, ignoring the glorious members.aol.com days), I mentioned Raisin Mini-Wheats. This was also back when I was incredibly cheap with bandwidth, presumably, since I have no other explanation for the awful compression I put that picture through. 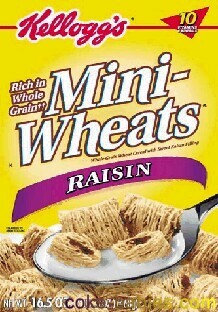 The fruit Mini-Wheats came in a few other flavors, but Raisin was far and away the best. This is, without a doubt, one of my favorite cereals ever. And it was taken away from me. The only explanation for this is that someone with power didn’t want me to reach high levels of happiness, so they put pressure on Kellogg’s (no apostrophe in this case? I don’t even know) to cancel the cereal. There is no other logical explanation. So the other day when I was in the store, and looking in the Frosted Mini-Wheats section (which by now is up to approximately twenty nine varieties), my life was given renewed hope. Usually whenever I see the “NEW!” slogan on a Mini-Wheats box, it just means they added some new flavor to the frosting. Probably “Blueberry Cobbler Struesel Banana Cream Pie” or something similar. Some of the flavored Mini-Wheats are good, but I’ll stick with the original. Although the Strawberry Delight does make the milk taste like Strawberry Quik, so it’s got that going for it. And I certainly avoid Post’s version. Little thin squares of danger. Those corners are sharp. 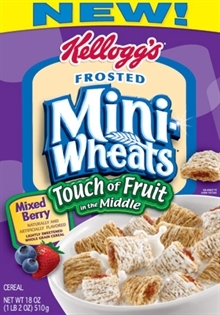 No, instead of a new frosting flavor, Kellogg’s had reached into their glorious history and was inspired by one of their greatest creations ever: the Mini-Wheat filled with fruit. The downside I saw was immediate: instead of Raisin, it was “Mixed Berry”. That was mildly alarming. One reason Raisin tends to be a good filling is because it’s not disgustingly sweet. Too often “Mixed Berry” just tastes like the inside of a Pop-Tart. Which is good when you’re eating a Pop-Tart, not necessarily for cereal. Also, please bring back the Pokemon Pop-Tarts. Those were amazing. The other change was that this time the fruit Mini-Wheat was frosted. This was also a bit of a concern, since I was worried that the frosting plus the filling would make it too sweet. Just to clarify, this isn’t a retroactive thought process. This is what actually goes through my mind while looking at cereal. Despite my minor concerns, that didn’t stop me from making what I felt was a wise investment – four boxes of “Frosted Mini-Wheats – Touch of Fruit In the Middle – Mixed Berry” cereal. Boy, that just rolls right off the tongue, huh? Instead of waiting until I woke up in the middle of the night at 3 AM to eat cereal like I usually do, I had a bowl as soon as I got back to work. As soon as I did, all my concerns were washed away. I don’t know if this was a conscious decision by Kellogg’s, or if it is just my need to rationalize this cereal’s need to exist (because it DOES), but it seems like the Mini-Wheats themselves have less frosting than the other varieties. If this was done on purpose: Bravo, Kellogg’s. Your cereal scientists brilliantly knew to balance the frosting and fruit without being too sweet. As for the filling, I like it. Admittedly, it’s no raisin. Hence it not saying “Raisin” on the box, so fair play to Kellogg’s. But for “Mixed Berry”, it’s not at a super sweet level, so it makes for a good balance. The overall cereal experience – fan-freaking-tastic. The first bite I had, where it went from crunchy/sort-of-like-a-bale-of-hay wheat to that very slightly chewy center, I had flashbacks to the Raisin Mini-Wheats. I don’t normally grade the food I review, I usually just let the review speak for itself. Which probably isn’t a very good idea. So in this case, I will declare Touch of Fruit Mini-Wheats to receive the grade of A++++100%+++. Plus. So please – PLEASE – go out to the store and buy thirty boxes of these. If you don’t want them, send them to me. I’ll split the postage. But this cereal needs to sell extraordinarily well, so it continues for a long, long time.